On January 17, 2018, CPC President & CEO, Wayne Ho, spoke on the "Voter Inspiration" panel with Jacob A. Riis Neighborhood Settlement Executive Director, Christopher Hanway, during the United Neighborhood Houses (UNH) Executive Directors Retreat. The discussion focused on voter engagement on a community level and how both leaders integrated voter registration and "Get Out To Vote" initiatives into their organization's structures. 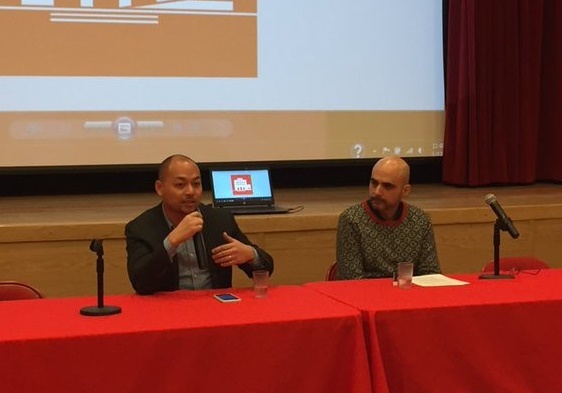 Mr. Ho and Mr. Hanway discussed the importance behind the role settlement houses play in inspiring New Yorkers to vote as well as the role they play as organization leaders to encourage their staff to be excited about mobilizing voters. While speaking on the Asian civic engagement experience in NYC, Mr. Ho said, "Asian Americans are naturalized at the highest rates, but they vote at the lowest rates. Combined with the fact that they are fastest growing population in NYC (currently 15% and growing), there is an opportunity to better engage them civically." As a part of CPC's vision to empower our community, CPC meets this new need for civic education and voter mobilization through various initiatives such as APA VOICE and Community Votes. CPC's Queens Community Services and Education & Career Services have implemented these initiatives to encourage eligible citizens to register to vote, be aware of upcoming elections, and know their rights as a voter to various services such as translation. CPC also encourages participants, regardless of age and voting eligibility, to get involved through phone banking, door knocking, and other Get Out the Vote efforts.